The tableland of Mantinía (altitude about 700 meters) in the heart of the Peloponnese peninsula is inundated with rainwater in winter time. This water is drained by rivers and swallowed up by sinkholes ("Katavothres") at the rim of the plane, where high mountains arise up to nearly 2000 meters. After the winter these river beds and the sinkhole caves are dry. Some of the largest sinkholes, up to 4 meters in diameter, belong to the large cave close to the village of Kápsia. If the runoff gets clogged by rubbish, the plain is inundated. It is important for the farmers and villagers to prevent their dwellings, farms and fields from flooding. Therefore they built a curtain wall with canals and gratings around the swallow holes. The whole installation looks like a little fortress. Kapsia cave holds a wealth of colourful large stalactites and other sinter formations of wonderful beauty. This unique piece of natural art elates the visitor with dazzling colours of teal, blazing red and ocre, mixed with brilliant white. In 1892 the cave was explored by the Greek engineer N.-A. Sidéridès and the Frenchmen Ch. Gadouleau and J. Valiche. They were the first to discover the deeper parts beyond the first room of about 15 x 8 meters. The French caving magazine Spelunca published an Article with cave plans about Kápsia cave in 1911. 1974 a group of Greek and French speleologists under the direction of I. Ioánnou penetrated further into the cave to unknown passages with rich adornment. Coated by half a meter of clay, many human skulls and bones of adults and children, sherds of pottery covered with sinter and oil lamps from a late hellenistic period were spotted. A couple of years ago attempts have been made to develop this natural monument into a touristic attraction, but the efforts have soon been given up. 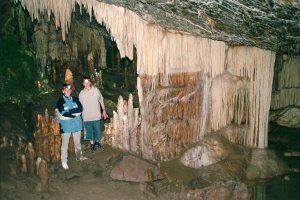 In April 2004 I explored the cave with my son Jonathan Schubert and his friend Lukas Pusch.